Purcell & Kennedy is a Waterford firm of solicitors, delivering the full range of expert legal advice and actions in both the personal and commercial fields. The firm had recently seen a name change due to the retirement of a previous partner and the replacement of that person’s name with the new partner, Kennedy. They wanted a new Web Design as part of their re-branding. We discussed the client’s requirements with them, and established they would be happy at first with a basic brochure website to introduce the two partners, give the company history, and outline the range of services offered. More detailed information on legal areas covered may be added at a later stage. 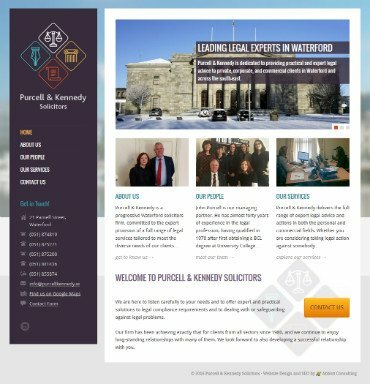 We reviewed existing websites of other law firms in Waterford and elsewhere in Ireland, to ensure our design would compare favourably to the competition, and we agreed an overall structure for the build for Purcell and Kennedy Solicitors. Our senior copywriter spoke to a company representative to obtain all details needed for content, and efficiently composed succinct yet informative text content that met all client needs and expectations. Our web developer identified a framework for the website that would reflect the professional approach of the firm, and have the crucial contact information visible at all times. Once the content was approved by the client, it was added to the framework, along with a selection of photographs and illustrations – some of which were supplied by the client, and some of which we sourced ourselves. Meanwhile, the ‘Our Services’ page was structured so as to allow easy future integration and linking to further pages, when the client wishes to add to the site. This was an express website build, showing how quickly we can develop a brochure site for a client, as the site was ready to go ‘live’ just 48 hours after our copywriter went to work. Just click here to see the finished product – and how we got Purcell & Kennedy Solicitors on the move. We were very impressed by the speed at which New World Digital worked, and how easy they made the process for us. Their senior copywriter spoke to us on a Monday morning to get all the details required, and the site was ready to go live by Wednesday lunchtime! Our new site is ‘clean’, elegant, and professional, and meets exactly the specifications we set out for the project. We are very happy with it and we have no hesitation in recommending New World Digital to others too. To get your Web Design Waterford quotation please contact us and one of our team will call you back to help you.